We’d love your help. Let us know what’s wrong with this preview of The Great Dinosaur Debate by Robert T. Bakker. To ask other readers questions about The Great Dinosaur Debate, please sign up. is the book interesting all the way through? In which Bob Bakker uses self-proclaimed heresy to debunk orthodox dinosaur theory, systematically dismantling our age-old perception of dinosaurs as trundling zombie-like lizards, unsuccessful as a species despite millions of years of planet-wide dominance eradicated by an extinction-level event, and replaces it with our contemporary understanding of the creatures as vibrant, warm-blooded creatures more closely related on the tree of life to birds than reptiles. Accomplished by addressing what B In which Bob Bakker uses self-proclaimed heresy to debunk orthodox dinosaur theory, systematically dismantling our age-old perception of dinosaurs as trundling zombie-like lizards, unsuccessful as a species despite millions of years of planet-wide dominance eradicated by an extinction-level event, and replaces it with our contemporary understanding of the creatures as vibrant, warm-blooded creatures more closely related on the tree of life to birds than reptiles. Accomplished by addressing what Bakker considered glaring inconsistencies in a monolithic and untouchable set of purported untestable hypotheses with simple questions (e.g., how would a cold-blooded brachiosaurus pump blood all the way to its head? Answer: it probably couldn't, thus, brachiosaurus was warm-blooded--though this is not the only, nor the strongest, case for warm bloodedness). Bakker demonstrates his acumen by seeking dinosaur behavioral answers through more than mere observation of the place where the bones were found, utilizing comparative physiology to prove duckbill dinosaurs were not water-loving swimmers; debunking dinosaur behavior by presenting the common methods of fossilization, how those processes sometimes distort our understanding of dinosaur environment, and methodologies to determine the type of environment in which the dinosaur perished; espoused the possibility of dinosaur gizzards, as similar to birds and alligators; and many, many more that have shaped our current understanding of how dinosaurs lived. 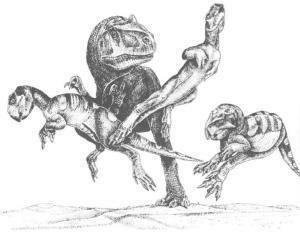 Old theories--like the reptilian nature of dinosaurs--are accepted like old friends of the family. You don't yell at old Aunt Cecilia. So hundred-year-old dinosaur theories live on without being questioned, and too often they are assumed to be totally correct. Even when such theory is caught in an error, it's likely to be excused. Traditional dinosaur theory is full of short circuits. Like the antiquated wiring in a overaged house, the details sputter and burn out when specific parts are tested." Thanks to Bakker, the chunky sauropod and upright Tyrannosaur are no longer models of our understanding, overturning that long-held belief by revisiting the work of scientists who determined dinosaur hips were more closely related to birds than lizards yet clung stubbornly to the presumption of dinosaurs as giant lizards though the truth stared them in the face. Now we have dinosaurs that are lithe and clever, thoroughly dominant in their era, therapods (bird relatives, such as deinonychus, troodon, and even the tyrannosaurs) that are bird-like in their behavior, colorful and, in some cases, feathered too. Bakker also illustrated the book himself, using pencil drawings from his notebook, belying a second elite skill. It seems almost unfair that he is able to articulate his knowledge of dinosaurs both in text and illustration. My own drawing skills rank somewhere below wretched, possibly not even on the spectrum of "skill", and here my reverence turns a bit toward envy. Jiminy Crickets. He probably gives free harp concerts in his spare time, too. Almost 30 years, and three Jurassic Park movies (which have their own errors) have passed since the publication of Bakker's book, and in that time his heresies have gained serious traction. It's visible everywhere dinosaurs are present, in media as well as museums. 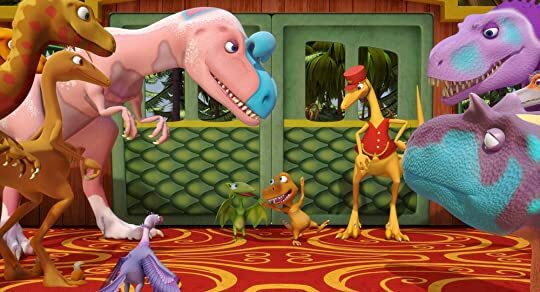 Dinosaur skeletons have been reworked to match an appropriate arrangement of the hips (i.e., the pitched forward rather than upright stance of most therapods and other bipedal dinosaurs) and, apart from a few anthropomorphized pre-school dinosaurs and flying reptiles, modern educational programs reflect a colorful, feathered family of dinosaurs. Dr. Robert Bakker has a clear and literate writing style that makes a reader with several graduate degrees less than he has understand the concepts of mass extinctions, dinosaur anatomy, and other advanced topics. It is easy to easy why this has become a seminal book. The work may be a bit dated and I'm not entirely sure if any subsequent discoveries have refuted his theories but this was a great read for me. This book is essentially a compilation of several of his graduate theses but I truly en Dr. Robert Bakker has a clear and literate writing style that makes a reader with several graduate degrees less than he has understand the concepts of mass extinctions, dinosaur anatomy, and other advanced topics. It is easy to easy why this has become a seminal book. The work may be a bit dated and I'm not entirely sure if any subsequent discoveries have refuted his theories but this was a great read for me. This book is essentially a compilation of several of his graduate theses but I truly envy on how he's able to bridge the gap between his readers despite using technical terminologies. Parasaurolophus trumpeted and Triceratops bellowed their siren songs and I couldn't help myself. I had to read this book again. Although this book was published in 1986, it holds up very well in my opinion. Dr. Bakker's writing is clear, concise and many times humorous. His drawings also give life to the dinosaurs and other critters he writes about. This is one of those books that inspires this geek's imagination every time I read it. My much beloved and battered copy is covered in notes, doodle Parasaurolophus trumpeted and Triceratops bellowed their siren songs and I couldn't help myself. I had to read this book again. My much beloved and battered copy is covered in notes, doodles and cartoons. It is also nearly covered in tape to keep the pages from falling out. Can I give any higher praise than that? Bakker's approach seems to follow the premise that the laws of physics and the rules of physiology do not change over the eons. If a certain characteristics point to warm bloodedness now, they would also indicate warm bloodedness 65 million years ago. This book was published in the 80's, so it's pretty outdated now in terms of dinosaur species. However, Robert Bakker was the first to put forth the notion that dinosaurs might have been warm blooded and not reptiles at all, which changed everything we thought we knew. Because of his "heretical theories", we now know that dinosaurs were indeed warm-blooded and that birds are direct descendants from them! Being a huge dinosaur nerd, I had to go back to the original source and learn how he support This book was published in the 80's, so it's pretty outdated now in terms of dinosaur species. However, Robert Bakker was the first to put forth the notion that dinosaurs might have been warm blooded and not reptiles at all, which changed everything we thought we knew. Because of his "heretical theories", we now know that dinosaurs were indeed warm-blooded and that birds are direct descendants from them! Being a huge dinosaur nerd, I had to go back to the original source and learn how he supported this now-accepted theory. An oldie but a goody, enjoyed this book though Bakker seems to be dead set on calling Apatosaurus by the well known but incorrect name of Brontosaurus. Understand his reasoning about honouring Marsh but it was distracting. Bakker was really the skunk at the garden party when his book suggested, among other things, that dinosaurs were not the cold-blooded reptiles we've always believed them to be but rather warm-blooded creatures from which our modern day birds descended. This theory is now widely considered to be the prevailing truth but when this book hit the scene in the late '80s it caused quite an uproar. This is a very readable book and I'd like to get my hands on the updated edition some day. If you never out Bakker was really the skunk at the garden party when his book suggested, among other things, that dinosaurs were not the cold-blooded reptiles we've always believed them to be but rather warm-blooded creatures from which our modern day birds descended. This theory is now widely considered to be the prevailing truth but when this book hit the scene in the late '80s it caused quite an uproar. I read this book several years ago after first starting it in about 1989. Some of the theories may be out of date now, but it was apparent to me that others are receiving wider consideration these days. I found the book easy to read and very interesting. Even if it is out of date, I would recommend it to anyone with an interest in the area. I adored every page of this book. Regardless of whether you ascribe to his theories Bakker keeps you thinking and communicates his work very well indeed. This is everything a dinosaur book should be as it not only introduces the reader to scienticic theories but also allows the reader to understand the development of the theories. Despite the fact it was first published in the late 80’s, most of Bakker’s theories and observations seem to hold true even today. Truly a genius of his time, I was thrilled to finally have the chance to read this and was not disappointed. Bakker writes in an easy-to-understand style but doesn’t talk down to his readers. As someone with no lofty graduate degrees, I appreciate his ability to so easily explain complex science to basically anyone. His writing is often inundated with personal anecdo Despite the fact it was first published in the late 80’s, most of Bakker’s theories and observations seem to hold true even today. Truly a genius of his time, I was thrilled to finally have the chance to read this and was not disappointed. Bakker writes in an easy-to-understand style but doesn’t talk down to his readers. As someone with no lofty graduate degrees, I appreciate his ability to so easily explain complex science to basically anyone. His writing is often inundated with personal anecdotes and humour that, instead of distracting from his point, make it feel like sitting in a class lecture with a favourite professor. Bakker’s work covers a wide range of topics, including ecology, biology, and basic paleo theories, so there’s a good variety of things to learn and it doesn’t lag covering just one or two subjects. His illustrations never feel like filler—they are always used to further explain or reiterate his points in a clear visual format, which is helpful for the more complex and advanced topics. I also appreciated his anecdotes on the history of the field through the ages, including his discussion of others’ research, as well as his explanations of how theories are formed (even the ones he doesn’t necessarily agree with). This is one of the best books for anyone interested in the field of palaeontology, especially beginners. I suggest reading alongside newer works, as some of the info is a tiny bit dated, but his main theories are very well-researched as well as logical, and easily stand the test of time. There’s a reason this book is a classic. The Dinosaur Heresies is a book which learns us how to look dinosaurs. It is against old-fashioned (or as Bakker called Orthodox) theories. Each chapter is about one aspect of dinosaurs that should be seen under a different view point. This book modified those ancient atchosaurs from cold-blooded, lazy reptiles into warm-blooded, swift Dinosaurs! Although the book is old, there are great information about dinosaurs. On the other hand, some details now are outdated. Structure of pterosaurs, causes The Dinosaur Heresies is a book which learns us how to look dinosaurs. It is against old-fashioned (or as Bakker called Orthodox) theories. Each chapter is about one aspect of dinosaurs that should be seen under a different view point. This book modified those ancient atchosaurs from cold-blooded, lazy reptiles into warm-blooded, swift Dinosaurs! Although the book is old, there are great information about dinosaurs. On the other hand, some details now are outdated. Structure of pterosaurs, causes of extinction and some others are outdated. Hence I learned that, if we thought we have the most heresy thoughts, we should always bear in our mind that there is other facts and explains which they are more peculiar than ourselves. For instance, now we know that almost every dinosaurs had feathers. This was unbelievable on the bakker time. Reading Bakker's 1980s "Dinosaur heresies" in the 2000s, not all of his theories have stood the test of time (such is the way of science, especially in a field where so many major new discoveries have been made over the past three decades), but several of his key arguments, such as the close link between dinosaurs and modern birds, have stood the test of time and are now widely accepted. From a modern standpoint, reading this book is a fascinating look back at a pivotal earlier era in paleontolo Reading Bakker's 1980s "Dinosaur heresies" in the 2000s, not all of his theories have stood the test of time (such is the way of science, especially in a field where so many major new discoveries have been made over the past three decades), but several of his key arguments, such as the close link between dinosaurs and modern birds, have stood the test of time and are now widely accepted. 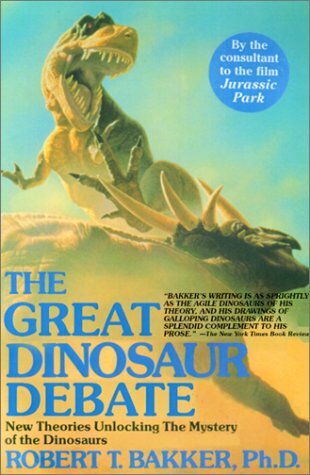 Though this book is old (1988), the controversy it discusses continues today with research on the exact lines/arguments Bakker put forth to show that dinosaurs, not the cold blooded plodder reptiles of scientific orthodoxy of the time, were warm blooded, thus much more vital and fast moving than scientists had concluded earlier. 2014 research is coming to the same conclusions, based on the very evidence Bakker offered in his book. Not heresy anymore, though the orthodox view hasn't died yet. The Though this book is old (1988), the controversy it discusses continues today with research on the exact lines/arguments Bakker put forth to show that dinosaurs, not the cold blooded plodder reptiles of scientific orthodoxy of the time, were warm blooded, thus much more vital and fast moving than scientists had concluded earlier. 2014 research is coming to the same conclusions, based on the very evidence Bakker offered in his book. Not heresy anymore, though the orthodox view hasn't died yet. Наконец-то добил знаменитую книгу. Увы, как говорится, со временем некоторые ереси перестают быть такими уж еретическими. Те пункты, по которым Бэккер был прав (оперение динозавров, птицы-динозавры и т. п. ), теперь проходят по категории "ну это же все знают", и сейчас странно читать, что когда-то кто-то с этим спорил. А где неправ, там и сейчас неправ. Разве что иллюстрации по-прежнему огонь. Надо было в восьмидесятых читать. Fascinating read, aimed for the general reader. Why didn't I read this book when I was 10 years old? I just happened to stumble upon it when browsing some shelves at my library. I'd already read Raptor Red and thought the author had a good way with words, and as dinosaurs' always interesting I thought I'd give it a go. I wasn't disappointed in the least! The book is almost 30 years old at the moment and quite a few of the theories presented are not so new, extraordinary or heretical, as Bakker calls them. But it's still interesting to read of ho Why didn't I read this book when I was 10 years old? The book is almost 30 years old at the moment and quite a few of the theories presented are not so new, extraordinary or heretical, as Bakker calls them. But it's still interesting to read of how he's been working to prove that the dinosaurs where warm blooded, had a high metabolism, were active and birdlike. Instead of the, at that time, common image of the slow, sluggish crocodile like colossus. An evolutionary dead end. Bakker gives lots of proof and arguments against the older orthodox thinking and can be quite funny from time to time when he pokes a hole in some flawed arguments or theories. Not even himself is totally safe in that regard. The fact that he's illustrated the book himself with beautiful, and sometimes quite funny, black and white images just adds to the overall experience. I'd have given quite a bit to have this guy write the textbooks I was required to read during my studies... unfortunately I didn't study palaeontology. When I was a kid back in the 1970s, dinosaurs were tail-dragging beasts that lumbered across a swampy landscape with spewing volcanoes in the distance. They were invariably gray or green, cold-blooded, and they were most certainly dead. In the late 80s that view changed, and shortly thereafter the movie Jurassic Park showed us some fearsome and fast-moving bird-like monsters that dined on lawyers. I like the newer version much better! Apparently, this was the book that challenged the old view and When I was a kid back in the 1970s, dinosaurs were tail-dragging beasts that lumbered across a swampy landscape with spewing volcanoes in the distance. They were invariably gray or green, cold-blooded, and they were most certainly dead. In the late 80s that view changed, and shortly thereafter the movie Jurassic Park showed us some fearsome and fast-moving bird-like monsters that dined on lawyers. I like the newer version much better! This was actually a lot better than I thought it would be. As a thirty year old book of dinosaur "heresies", I expected to read a mixture of well-accepted theories and long ago discarded hypotheses--and that is exactly what I did read. However, Bakker walks the reader through the well-known stuff, and gives so many arguments, and writes them so well, that it all seems fresh and new. For example, most people reading about dinosaurs are aware that they were probably warm blooded, but not all of th This was actually a lot better than I thought it would be. As a thirty year old book of dinosaur "heresies", I expected to read a mixture of well-accepted theories and long ago discarded hypotheses--and that is exactly what I did read. However, Bakker walks the reader through the well-known stuff, and gives so many arguments, and writes them so well, that it all seems fresh and new. For example, most people reading about dinosaurs are aware that they were probably warm blooded, but not all of the arguments that support this idea. Bakker walks us through them all, giving much better weight than the average reader might have seen before. The author presents some very interesting theories challenging traditional interpretations of dinosaurs, such as using the presence of Havesian canals in their bones to argue that dinosaurs had more in common with mammals than with reptiles. However, this doesn't make up for the loads of evolutionary garbage piled all through the book, like the chapter arguing that dinosaurs evolved into birds. Also, the evidence he cites for some of his theories appears weak. For example, chapter 18 uses the arg The author presents some very interesting theories challenging traditional interpretations of dinosaurs, such as using the presence of Havesian canals in their bones to argue that dinosaurs had more in common with mammals than with reptiles. I can thank the Discovery Kids network for this one--they had Bakker on their show all the time (and Horner). I really enjoyed this book-more than I expected to. Bakker's a good writer. I don't want to act surprised about that, but I am a little. I didn't think I'd enjoy reading someone's research this much. Good for the layperson (e.g., not a paleontologist) to learn more about newer theories on dinosaur behavior, physiology, and extinction. FYI, there's an obscure reference to Bakker in the Jura I can thank the Discovery Kids network for this one--they had Bakker on their show all the time (and Horner). Bakker was born in Bergen County, New Jersey. He attributes his interest in dinosaurs to his reading an article in the September 7, 1953 issue of Life magazine. He graduated from Ridgewood High School in 1963. At Yale University, Bakker studied under John Ostrom, an early proponent of the new view of dinosaurs, and later gained a PhD at Harvard. He began by teaching anatomy at Johns Hopkins Univers Bakker was born in Bergen County, New Jersey. He attributes his interest in dinosaurs to his reading an article in the September 7, 1953 issue of Life magazine. He graduated from Ridgewood High School in 1963.